First, I must apologize to my readers (both of you!) for the long delay in posting. I have moved to DC for my new life as a law student at the George Washington University Law School; thus, for the last two and a half weeks or so I’ve been busy getting ready to leave California, traveling to DC, and settling into DC life. And settle in I have! DC is a great place thus far–definitely more humid than I’m used to, and subject to strange liquor laws that prohibit my buying beer, wine, or liquor in markets or drug stores (what gives, DC?). However, DC is home to a great deal of wine stores, bars, pubs, and restaurants with wonderful, wonderful happy hour bargains. And I have met some good people here, both my future classmates and friends of my roommate, Alex, who works at a local think tank. I’ve already been to a wine tasting and taken an unofficial tour of some of the wine shops in the area. And I HAVE had a bit of wine, notably a 2006 Morgon beaujolais from Jean Descombes (Georges Duboeuf) that was tremendously thirst-quenching after a hot summer afternoon. I also have a Julienas beaujolais–also from Duboeuf)–that arrived as a housewarming gift waiting in the fridge and a Rosso di Montepulciano from Avignonesi that I will be drinking tonight at a spaghetti dinner in Crystal City. I wanted to talk about my last night in LA, however: maybe it’s the passage of years, but I am actually more homesick than I thought I would be. I also miss my parents and family much more now as a 25-year-old than I did as a young naive 18-year-old shipping off to Berkeley. It might be because I have a greater sense of mortality now given certain events in my life; it might be because my dad’s 65 and not getting any younger. I find myself drawn back to California because that is where my family–and therefore my heart–is. 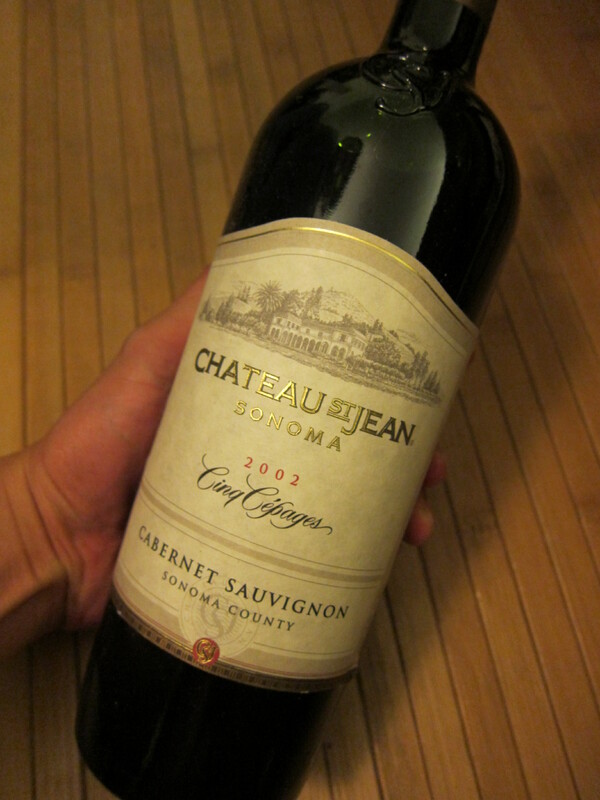 This last night we decided to open a bottle of Bordeaux my brother’s girlfriend had bought him when she visited the US. 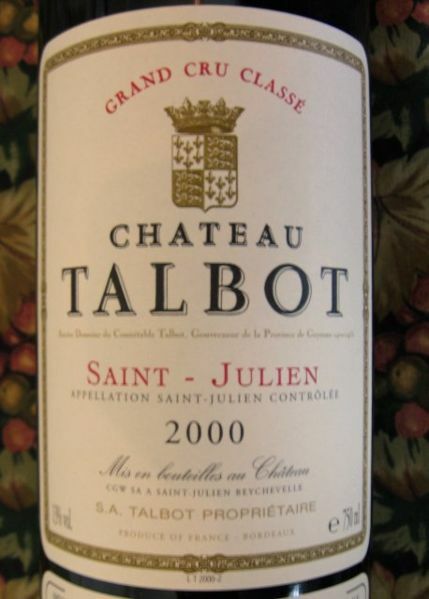 It was a 2003 Chateau Talbot (from Saint-Julien), a fourth growth which consists chiefly of cabernet sauvignon and merlot, with smaller amounts of petit verdot and cabernet franc. The issue with this wine was that, since it was relatively (much) more expensive than any of the wines I’ve bought for home, we couldn’t find any suitable occasion to drink it. And we had it for over a year. I figured that since we weren’t really capable of storing it properly for much longer we would just have to drink it. Soon. I wanted to take it to a restaurant, maybe have the staff decant it to beat up the youngish tannins, and have it with a nice, thick steak. But alas, I was never in the mood to go out for a fancy meal for my last closing days, so we decided to open it up and drink it solo. Man. What a gorgeous wine. Full and round, like a voluptuous, raven-haired woman. Cherry and plum in the nose. Subtle spice and tobacco were what I tasted. But this wine wasn’t as much about the taste or aroma as it was about texture–just so smooth and yielding, so wonderfully structured. It went down like a potion made of velvet, and once it got to the stomach it felt warm and soothing like a nice port. And the finish? Long, stretching out all the way from that moment, that evening, to the pages of memory.